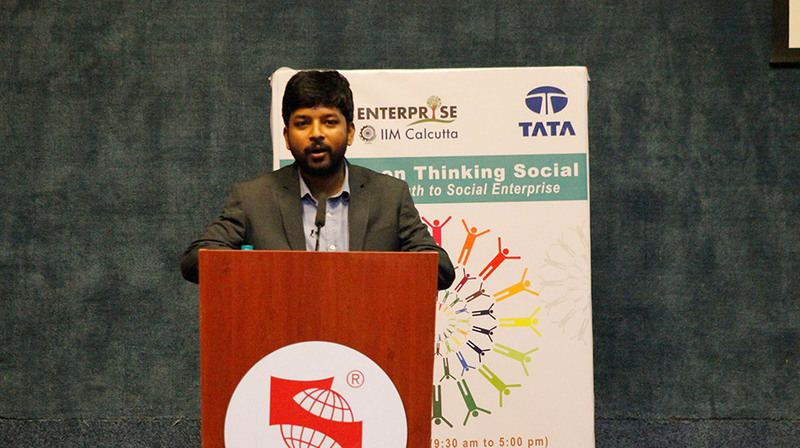 IIM Calcutta Innovation Park in association with the TATA group hosted the Thinking Social Seminar at the International Management Institute, on 4th Dec,2017. The primary objective of this event was to build awareness on social entrepreneurship, generating interest and inspiring the youth to come up with innovative solutions to prevalent social challenges. The speakers at the seminar comprised of eminent and social entrepreneurs, investors and members of the academic field being individuals who have been accredited of having established their own outstanding ventures creating a strong social impact. The panel at the event comprised of seasoned entrepreneurs including Dileep Kumar (Tata Power Delhi), Suman Mukhopadhyay(Director – Banglanatak.com), Arun Nagpal (Founder – Mrida), Anirban Gupta(Founder – Dhriiti), Pawan Mehrotra(Founder – Aarna Biomedical Products Pvt. Ltd) and Neha Arora(Founder – Planet Abled). Mr. Dileep Kumar cheered the inaugural session mentioning the activities TATA Group had undertaken till date. Mr. Suman Mukhopadhay enlightened the audience about aspects of Social Entrepreneurship and relevance of smart solutions to solve development challenges, Clarity was brought about to the concept of ‘social entrepreneurs’ being entrepreneurs who aim to solve prevalent societal problems, either for-profit or non profit..
Mr. Arun Nagpal spoke about his journey as an entrepreneur . His journey that started a decade ago wherein he believed that not all the solutions to India’s problems could come from the government or a body Corporate. Mr. Nagpal stated that he believed in solutions to prevalent social issues to be brought about by entrepreneurs, individuals who have had a strong relationship with an issue and are committed to designing a solution for it. Explaining his venture ‘Mrida’ having its nomenclature roots in Sanskrit which meant ‘Soil’ Mr. Nagpal explained that, the single word encapsulates what they stand for which would be working at the ground level, close to the soil, their work being directed mainly the Base of the Pyramid (BOP) individuals being their core customers. Speaking about his venture Anirban Gupta Founder of ‘Dhriiti – The Courage Within’ an NGO (social enterprise) registered under the Societies Act of 1860 established in December 2004 by Anirban and two other members. Anirban elaborated about Observing the problem of unemployment and underemployment in the country at large, and contemplating on how these problems could be tackled in the long run as well as providing immediate solutions .. He inferred that the problem of unemployment, disguised unemployment and underemployment cannot be dealt with, at all levels by creating more jobs in the government and the high investment public/ private sector. The Founder believes that self-employment and entrepreneurship is an important tool to counter the problem of widespread unemployment and underemployment in the country. The core idea behind Dhriiti as he spoke was the spirit of entrepreneurship that we want to promote, introduce and inculcate. Dhriiti works from the two ends of the continuum to spread a culture of entrepreneurship. Mr.Pawan Mehrotra Founder of Aarna Biomedical Products Pvt. Ltd a social entrepreneurship start-up, shared his experience and journey as an entrepreneur. Neha Arora Founder of Planet Abled affirmed that the world is nostalgic, whether we just feel it through our five senses or experience it wandering on a wheel chair or our own feet. She said and we quote “This world is for everybody, whosoever it is. We should explore the world with an open mind, without any hindrance”. Further explaining her inspiration for her venture Neha spoke “My personal not so good travel experiences as a daughter of parents with disabilities led to the inception of Planet Abled. Mfather is blind and mother is a wheelchair user, but we all are fond of traveling.” The zeal to travel but the difficulties that she had faced while travelling lead her to break every barriers and create her own travel agency for disabled people. The seminar concluded with an interactive Q & A session, where questions were posed by the students and faculty members. IIM Calcutta Innovation Park in association with the TATA group hosted the Thinking Social Seminar at IITM Research Park, Chennai, on the 21st November. The primary objective of this event was to build awareness on social entrepreneurship, generate interest and inspire the youth to come up with innovative solutions to social challenges. The speakers of the seminar comprised of eminent and social entrepreneurs, investors and members of the academic field who have established their own outstanding ventures touching the lives of thousands .. The seminar commenced following a welcome address by Mr Gaurav Kapoor. Mr. Gaurav Kapoor emphasized on the subject of being a social entrepreneur he added and we quote “Being social doesn’t just mean being on the social media but also being Social in the true sense of the word. A social entrepreneur is a person who pursues novel applications that have the potential to solve community-based problems. These individuals are willing to take on the risk and effort to create positive changes in society through their initiatives”. Mr. Sabarinath C the Founder CEO of Skillveri Training Solutions Private Limited,spoke about his venture which helps in addressing India’s Skill Gap. Skillveri enables better quality delivery of practical vocational skill training at significantly lesser costs through its innovative, scalable platform of multi-skill simulators. The Venture has recently graduated from IIT Madras’ Rural Technology and Business Incubator (RTBI). During current times Skillveri has established itself as a market leader in the sector with a range of welding-training products and new offerings like spray painting, gold -jewelry soldering and medical skills. Mr. Kalyan Sivasailam (CEO – 5C Network) shared his experience about his journey as an entrepreneur. 5c Network being a technologically driven advanced telehealth platform focusing on Remote Radio diagnosis, offers the highest quality radiological interpretations at the fastest possible time. They connect the best radiologists to hospitals and diagnostic centers, thus solving the problem concerning lack of qualified radiologists at every hospital or diagnostic centers,. It is their innovative technology and business model, that makes 5C Network unique in the telehealth platform. They are India’s first diagnostic network, and their vision is to bridge India’s healthcare divide. Lastly Mr. Pradeep Thangappan the Founder of Enability Foundation For Rehabilitation, spoke about his venture which focuses on providing indigenous and affordable assistive technology solutions for rehabilitation workers, teachers, schools and resource centers. Their product iGest, captures gestures of children with cerebral palsy and converts them into a dictionary of sentences. IIM Calcutta Innovation Park in association with the TATA group hosted the Thinking Social Seminar at T-Hub, Hyderabad November 20th, 2017. The primary objective of this event was to build awareness on social entrepreneurship, generate interest and inspire the youthto come up with innovative solutions to social challenges. The speakers of the seminar comprised of eminent social entrepreneurs, investors and academicians who having established their own outstanding ventures and having an impact on the lives of thousands ..
of Banglanatokdotcom ,Mr. K.C .Mishra, Founder E-Kutir, Mr.Binayak Acharya- Founder,Tatvagyan ,Mr. Amar Kr Jamdhiar- Founder &CEOProsperita Medi360 Pvt Ltd, Ms.Ambika Satpathy- Co Founder,Zoofresh and Mr.Sanjib Parida – Founder,Orbonix. Mr. Suman Mukhopadhay chaired the session highlighting Social Entrepreneurship and the relevance of smart solutions to solve development challenges. He emphasized on the fact that today the social Entrepreneurs have a number of opportunities in their disposal and as such should be equipped to handle any situation and innovation that ultimately will lead to a solution as was mentioned earlier in the session by Mr. K.C .Mishra, Founder E-Kutir. The seminar ended with an interactive Q & A session, where questions were posed by the students and faculty members. 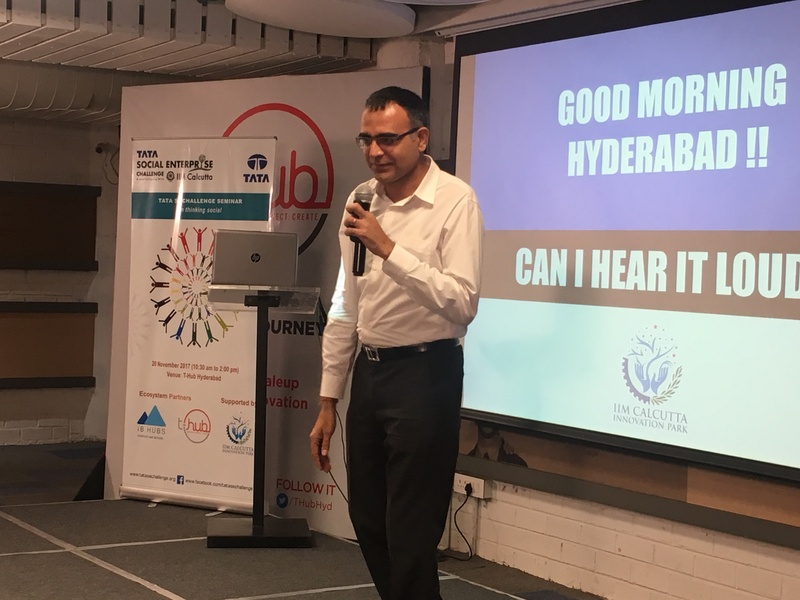 IIM Calcutta Innovation Park in association with the TATA group hosted the Thinking Social Seminar at T-Hub, Hyderabad on November 20th, 2017. The primary objective of this event was to build awareness about social entrepreneurship, generate interest and inspire the youth to come up with innovative solutions to social challenges. The speakers of the seminar comprised of eminent and social entrepreneurs, investors and members of academia having established their own outstanding ventures having an impact on the lives of thousands .. The panel of speakers comprised of esteemed entrepreneurs including Mr, Gaurav Kapoor: (Serial Social Entrepreneur), Mr. Brig P Ganesham Founder – President, Mr. Palle Srujana Prashant Lingam Co-Founder, Bamboo House India; Dr. Praveen Kumar SecretaryTelangana Social Welfare Residential Educational Institutions Society (TSWREIS). The seminar commenced following a welcome address by Mr Gaurav Kapoor, emphasizing on what it means to be social entrepreneur he added and we quote “Being social doesn’t just mean being on the social media but also being Social in the true sense of the word. A social entrepreneur is a person who pursues novel applications that have the potential to solve prevalent community-based problems. These individuals are willing to take on the risk and effort to create positive changes in society through their initiatives”. Brig P Ganesham Founder – President, Palle Srujana spoke about villagers who have their own knowledge and ways of expression. Stating facts that traditional knowledge of the villagers has been ignored and the rural people are not able to cope with modern knowledge being disruptive. Its urban populations responsibility to bring their usefulknowledge back by engaging in conversation with the rural people. The speaker said and we quote “The whole world is run by the people and for the people, henceforth we shouldn’t be dependent on the machine, we should extend our hand and help the farmers”. He mentioned that to become a social entrepreneur one needs to first become a coachable individual and have the right kind of skills set. Later Mr. Prashant Lingam Co-Founder, Bamboo House India spoke about his journey in social entrepreneurship. Bamboo House India is a social enterprise established by two first generation entrepreneurs Prashant Lingam ( Management Graduate) and Aruna Kappagantula (Science Graduate) in the year 2008 with an aim of utilizing bamboo as an economic driver for providing sustainable livelihood opportunities to rural and tribal communities dependent on bamboo for livelihoods and at the same time utilize bamboo as a eco friendly substitute for wood , steel, iron steel and plastic thus establishing the – Bamboo House in Hyderabad. Lastly spoke Dr. Praveen Kumar Secretary, Telangana Social Welfare Residential Educational Institutions Society (TSWREIS) about the zeal a social entrepreneur should have. He emphasized on the fact that a social entrepreneur should be ambitious and persistent, tackling major social issues and offering new ideas for wide-scale change. The seminar ended with an interactive Q & A session, where questions were posed by students and faculty members. SMART FIFTY :IMCIP & DST(Department of Science and Technology) launches Smart Fifty which is aligned to ‘Start-Up India’ movement and aims to promote socio-economic development in India. 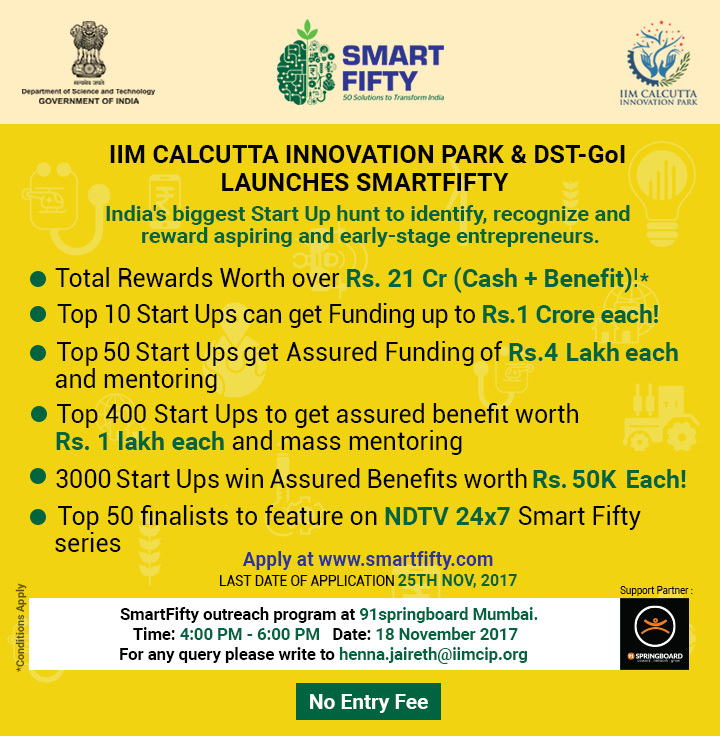 Smart Fifty is probably the biggest Start-Up hunt in India to identify, recognize and reward aspiring and early-stage entrepreneurs. The platform will focus on innovative ideas which can transform India from a socio-economic perspective, urging participants to present solutions that are SMART(Sustainable, Motivating, Affordable, Responsible and above all,Transformative). IIM Calcutta Innovation Park in association with the TATA group and Bihar Entrepreneur Association hosted the Thinking Social Seminar at Chanakya National Law University on 22 July 2017. The primary objective of this event was to build awareness on social entrepreneurship, generate interest and inspire the young generation to come up with innovative solutions to social challenges. On 21st July 2017 we had organized a business plan pitching session for social entrepreneurs in Bihar. 80 startups had applied for this and only 20 startups were shortlisted to participate in this event. The speakers of this seminar comprised of eminent and social entrepreneurs, investors and academicians who have already established their own outstanding ventures and have impacted the lives of thousands of people. The seminar commenced with the welcome address by Mr Abhishek Singh, Secretary General – Bihar Entrepreneur Association who spoke about how BEA was formed and the kind of work they are doing in the state of Bihar. He mentioned, “ We are a regional coalition of entrepreneurs, business and community leaders, organizations and local government dedicated to provide start-ups of Bihar with access to nationwide tools and resources that will help them scale up.” He also spoke about the Bihar Startup Yatra’s which they have been organizing in partnership with the Department of Industries, Govt. of Bihar since 2011. Mr. Vikram Duggal, Unitus Seed Fund spoke about the funding opportunities available to start-ups in the social entrepreneurship space. Mr Kaushlendra, Co-founder Samriddhi and President Bihar Entrepreneur Association spoke about the scope of social entrepreneurship in Bihar & Jharkand. He also explained to the audience the importance of technical knowledge. The seminar ended with an interactive Q & A session and the names of the top 3 winners of the Business Plan Pitching Session held the previous day were declared. TakGi: They are bridging the gap between the retailer and wholesaler for sourcing medicines, which is a major pain point, by assigning a dedicated staff who is required to source the medicines on a daily or weekly basis. The Ganna Cafe: The Ganna cafe provides freshly prepared hygienic and healthy sugarcane juice through a vending cart. This is done through a motorized machine in a single crush process. The ganna juice which they provide is hygienic, healthy and cost effective i.e. at par with the current market rate. R-Labs: They help engineering students to test their robotic programming on high end, state of art Robots which are located at various premium universities in Europe. 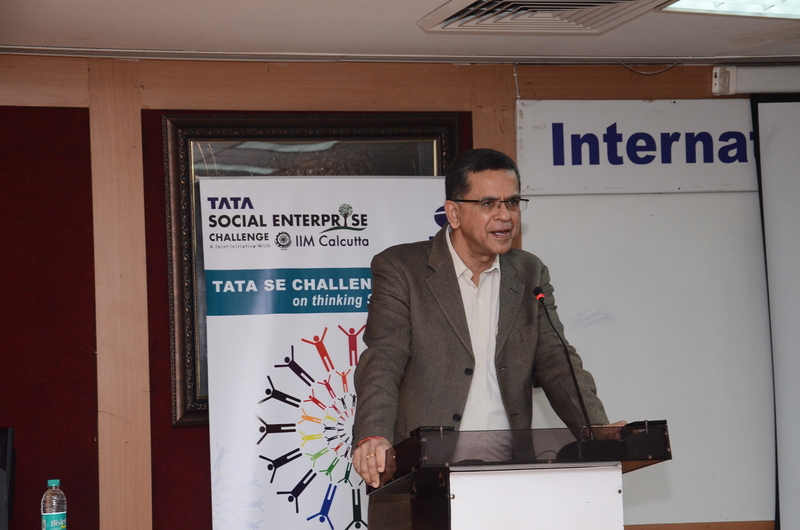 IIM Calcutta Innovation Park in association with the TATA group hosted the Thinking Social Seminar at Pacchunga University College on March 31st, 2017. The primary objective of this event was to build awareness on social entrepreneurship, generate interest and inspire the young generation to come up with innovative solutions to social challenges. The speakers of the seminar comprised of eminent and social entrepreneurs, investors and academicians who have already established their own outstanding ventures and have impacted the lives of thousands of people. The seminar commenced with the welcome address by Dr. C. Vanlalramsanga, IES, Secretary Planning Department and Alternate Chairman of Mizoram State Entrepreneurship Development Monitoring Committee (MEDMOC) who spoke about the various initiatives which the Mizoram government has been taking up on Entrepreneurship Development. He also urged the students to take inspiration from these social entrepreneurs so that they can take up entrepreneurship as a career option. Prof. C D Mitra, IIM Calcutta spoke about who is a social entrepreneur and how to identify gaps and create a business opportunity out of it. He said, “Being an entrepreneur is not only about starting your own venture, It is essentially finding a gap between what is and what should be. The moment you find a smart way to bridge that gap connected to a social problem and you create a business opportunity, you become a social entrepreneur.” He urged the students to innovatively solve some of the unsolved problems in the state. Mr. Vikram Duggal, Unitus Seed Fund said, “There are so many unresolved problems, especially in the North-Eastern regions of India. Social Entrepreneurs have tremendous opportunity to create profitable businesses and impact lives of underserved masses at same time. 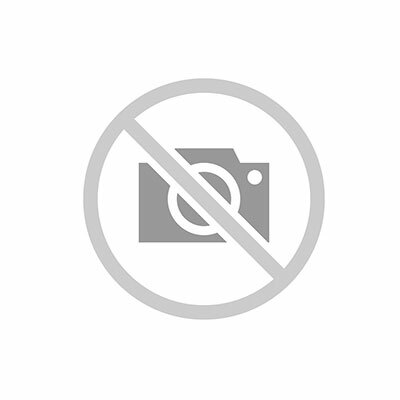 He also added that at Unitus Seed fund they need to see traction, among other things, before investing in any startup. Ten of the portfolio companies have raised series A and two have raised series B funding. Mr Gaurav Kapoor, Innokul, spoke about the various social issues plaguing our nation in the health, environment, education, population and employment sectors and how youth can take cognizance of these issues and come up with relevant indigenous solutions. He inspired the youth with videos of live examples of social enterprises that have solved some mammoth social challenges in their respective sectors. He also gave the audience a deep insight into the concept of social enterprises and how they function. The seminar ended with an interactive Q & A session, where questions were posed by not only the students but faculty as well. IIM Calcutta Innovation Park in association with the TATA group hosted the Thinking Social Seminar at Shiv Nadar University on April 8th, 2017. The primary objective of this event was to build awareness on social entrepreneurship, generate interest and inspire the young generation to come up with innovative solutions to social challenges. The speakers of the seminar comprised of eminent and social entrepreneurs, investors and academicians who have already established their own outstanding ventures and have impacted the lives of thousands of people. The seminar commenced with the welcome address by Prof. Partha Roy, Professor at School of Management and Entrepreneurship (SME), Shiv Nadar University. He was very happy with this initiative which they have conducting for the last three years. Prof. C D Mitra, IIM Calcutta spoke about who is a social entrepreneur and how to identify gaps and create a business opportunity out of it. He said, “The world is full of social problems which need to be solved. An entrepreneur who tries to solve these problems through his venture is a social entrepreneur.” He also conducted a small session with the students where he asked them to identify some problems in the country and think of a solution to overcome the problems. The students were very enthusiastic and came up with problems like – Pollution, Illiteracy, Mental Health, Poor conditions of the farmers, infant mortality etc. Neha Arora, Founder – Plantet Abled spoke about her venture and how she is helping the community with people having disabilities. She gave an insight to the audience about the lives and challenges of people with disabilities and hoped that they would now be empathetic and observant about how simple things can be path breaking for someone. 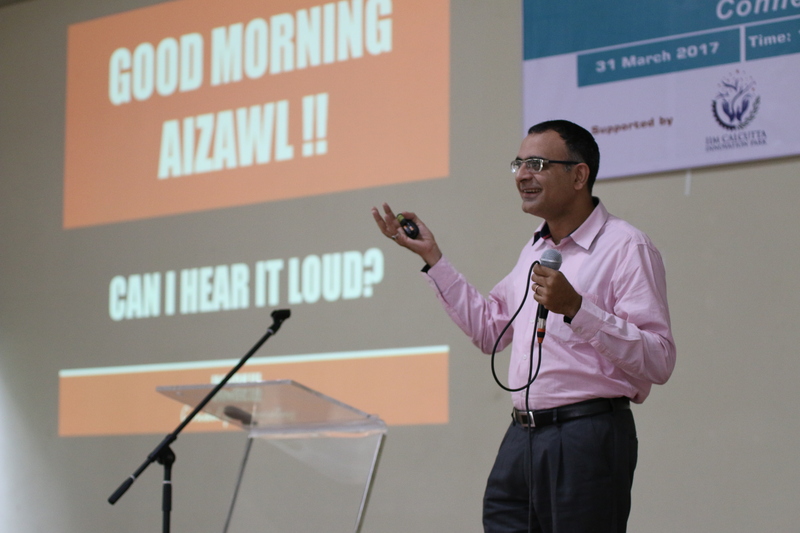 Kapil Mandawewala, Founder – Edible Routes, shared with the audience about how he started his venture after returning from the U.S as a consultant. Kapil had a keen interest in the agri-business sector which helped him to start Edible Routes. He mentioned that, “We don’t know where the food we eat is grown or what chemicals are used to grow it.” His organization – Edible Routes – conducts kitchen gardening workshops for adults and school children and they also set up kitchen gardens to help people grow their own vegetables and reconnect with nature. Dr Avijit Chakrabarthi, Founder – Bindubot, started by giving a simple definition of a social enterprise. He said, “To combine a social objective with a business formula is a social enterprise.” He also mentioned that. “Unless there is passion in the entrepreneur, the venture will not work.” Dr Chakrabarthi also spoke about how Bollywood is the biggest social enterprise in our country as it highlights (though it’s movies) some of the most prevalent social issues like – Poverty, unemployment, homelessness and other social issues. 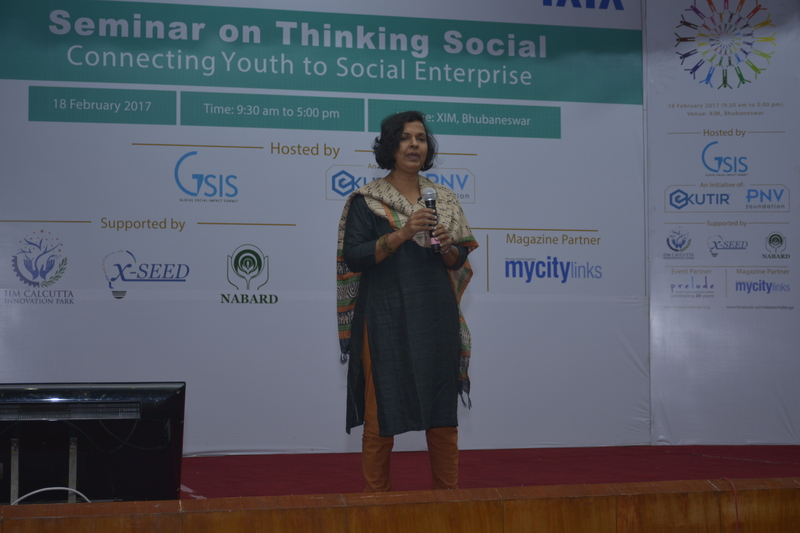 IIM Calcutta Innovation Park in association with the TATA group hosted the Thinking Social Seminar at XIM, Bhubaneswar in partnership with e-Kutir and PNV foundation as part of the GSIS (Glocal Social on February 18th, 2017. The primary objective of this event was to build awareness on social entrepreneurship, generate interest and inspire the young generation to come up with innovative solutions to social challenges. The speakers of the seminar comprised of eminent and social entrepreneurs, investors and academicians who have already established their own outstanding ventures and have impacted the lives of thousands of people. The speakers consisted of an esteemed panel of entrepreneurs including Mr. K M Mishra, Founder, e-Kutir; Smita Agarwal – Head CSR, Tata Steel; Mr. Jaynarayan Pujapanda, Founder, Sahaya Foundation; Mr. Joe Madiath – Founder Gram Vikas, and Tanaya Patnaik, Executive Director Sambad Group. Mr. Jaynarayan Pujapanda, Founder, Sahaya Foundation shared with the audience his inspiring journey from a sales person to an entrepreneur. He mentioned that to become a social entrepreneur one needs to first become an entrepreneur and have the right kind of skills set. He also spoke about how Paris Bakery, his profit venture has helped him to establish Sahaya Foundation. Mr K C Mishra, Founder – e-Kutir spoke about how social business is the need of the hour not only in extending marketing based principles but also a career opportunity for the youngsters. Dr. Birupaskshya Dixit, Practical Action spoke about how his organization is supporting social enterprises in Orrisa. His organization finds out what people are doing and helps them to do it in a better way. Through technology they enable poor communities to build on their skills and knowledge to produce sustainable and practical solutions- transforming their lives forever and protecting the world around them. Tanaya Patnaik, Executive Director Sambad Group interacted with the students and expressed her views on social entrepreneurship. She spoke about her ventures like – Sambad School of Media and Culture, Kanak News and Sambad newspapers and how these have contributed to social activities. The post lunch session started with 10 pitches from various entrepreneurs to a panel of judges whose ideas were shortlisted by XIMB and PNV foundation. There were many ideas which were generated to address the problems in various sectors like: agriculture, e-commerce solutions, healthcare services, education and other social problems of society. Three best ideas were awarded by the jury members. 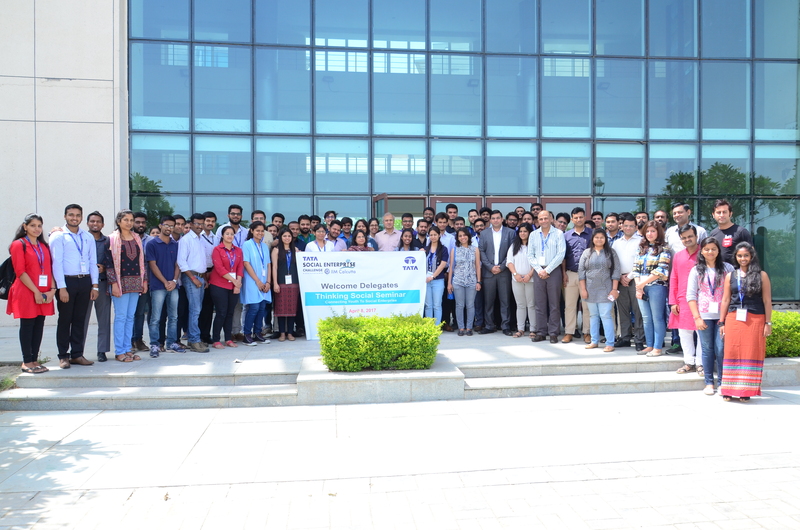 IIM Calcutta Innovation Park in association with the TATA group hosted the Thinking Social Seminar at Symbiosis Institute of Media and Communication (SIMC), Lavale, Pune on January 30th, 2017. The primary objective of this event was to build awareness on social entrepreneurship, generate interest and inspire the young generation to come up with innovative solutions to social challenges. The speakers of the seminar comprised of eminent and social entrepreneurs, investors and academicians who have already established their own outstanding ventures and have impacted the lives of thousands of people. The speakers consisted of an esteemed panel of entrepreneurs including Mr. Pradeep Lokhande, Founder and CEO – Rural Relations; Mr. Ramesh Menon, a veteran journalist, author, documentary film maker and a corporate trainer and a recipient of Ramnath Goenka Award for Excellence in Journalism; Mr. Shekhar Prabhakar, Co-founder – Hasiru Dala Innovations; Mr. Sushanth Kodela, Co-founder – Uncancer India, and Ms. Janhavi Joshi, Co-founder – Bleetech. The seminar commenced with the welcome address by Dr. Ruchi Jaggi, Director of SIMC, who praised the initiative for bringing a social dimension to innovation and entrepreneurship. Mr. Lokhande started off the technical sessions by recounting his journey from transforming a small idea to what is now known as Gyan Key, a rural library. The story of Mr.Lokhande is that of a humble entrepreneur, who’s passion drove the project which was a very strenuous process with no immediate returns on efforts put in. He urged aspiring innovators to create not for demand by for need. The last speaker of the day was Ms. Janhavi Joshi, who co-created an app that answered one simple problem: what if there was no music? Her innovation, Blee, allowed deaf dancers to hear music through vibrations. Although it was success, she spoke about the need for this type of technology to branch out to other aspects of life that could benefit their community. She expressed the need for technology like this, since there’s no innovation for the deaf community but there are technological advances for menial things in life. The duo’s main aim is the make affordable tech for a community that truly deserves it.